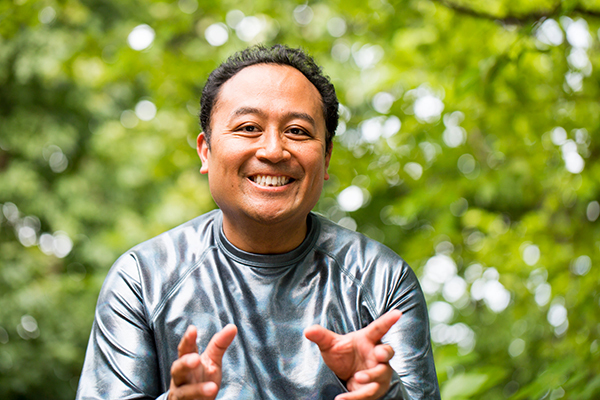 Regie Cabico loves the challenge of a one-man show. How does a queer boy in Maryland navigate his dream of becoming Coco from “Fame”? Cabico’s self-penned show “Faith, Hope & Regie” is an autobiographical story of his formative years as the gay child of Catholic immigrants. Performances are both nights at 7 p.m. at the Anacostia Arts Center (1231 Good Hope Rd., S.E.). Tickets and packages range from $20-50. Details at thedccenter.org/queertheatrefest. A longtime performer, Cabico has been featured on NPR and has taken prizes at D.C.’s Story District and various national poetry slams. Cabico, a Clinton, Md., native, came to Washington 11 years ago after nearly two decades in New York to run a non-profit. He’s single, lives in Columbia Heights and enjoys roller skating and reading poetry and plays in his free time. I came out when I was 20 after I wrote and performed my first poems for a poetry slam. The introduction to the anthology “Aloud: Voices from the Nuyorican Poets Cafe,” outed me as a gay Filipino. The hardest person to confront was myself coming from a Catholic background. La Ti Do cabaret series at Bistro Bistro. One gigantic, white chocolate-mousse cake. The 2016 U.S. presidential election results and the invention of the Electoral College. I insist on free hugs, consensual massages and free internet. Turn everyone into a Regie-sexual. Poetry is the architecture of the soul. My muse and freedom of speech. Gay Asian, subservient slave sidekick in search of Indiana Jones white guy. Sainthood canonization, but I think that boat has passed. The East Village New York days of a Madonna being discovered have died. Washington has a great theater community and a growing spoken word and literary movement. The D.C. Commission for the Arts & Humanities is an all-encompassing support as is Center Arts of the D.C. Center.